With all the attention that Breast Cancer Awareness Month gets during October, it’s easy to forget about the awareness campaigns that follow in November. 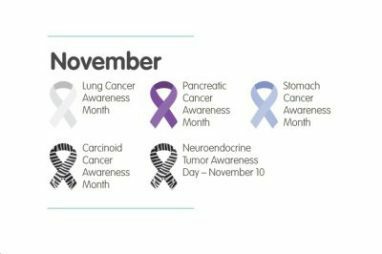 This month, you’re encouraged to help raise awareness for lung cancer, pancreatic cancer, stomach cancer, and carcinoid cancer. Raising awareness about the symptoms and risk factors for any type of cancer can help save lives. Here’s what you can do to make a difference in the future of lung, pancreatic and stomach cancer this November. Be sure to check back and read about carcinoid cancer and Neuroendocrine Tumor Awareness Day in our next blog post! Lung cancer is the leading cause of cancer death among men and women, accounting for 27 percent of all cancer deaths in the U.S. It causes more deaths each year than breast, colon and prostate cancers combined. Overall, lung cancer rates have been declining over the past few decades for men, but have only recently started declining for women. Part of this decrease may be due to more awareness about the harmful effects of smoking, which is thought to be responsible for up to 80 percent of lung cancer deaths. However, it’s not clear yet whether lung cancer rates are decreasing for some types and potentially increasing for others. Exposure to radon or asbestos. Workplace exposures such as diesel fumes, radioactive ores, and chemicals or minerals such as arsenic, vinyl chloride, coal, and others. Air pollution, such as smog in the atmosphere around large cities. Radiation therapy given to the lungs or chest area for other cancers. A personal or family history of lung cancer. A cough that gets worse or doesn’t go away. Chest pain that intensifies while breathing deeply, coughing, or laughing. Hoarseness or a new onset of wheezing. Unexplained weight loss or decreased appetite. Persistent infections such as bronchitis or pneumonia. Approximately 48,000 new cases of pancreatic cancer are expected to be diagnosed in 2015, accounting for 3 percent of all cancers in the U.S. These rates have remained relatively steady. Exposure to workplace chemicals such as pesticides, dyes, and chemicals used in metal refineries. Older age. The risk of pancreatic cancer increases with age, with 71 being the average age of diagnosis. Being male. Men are 30 percent more likely than women to develop pancreatic cancer. Being African-American. For unclear reasons, African-Americans are more likely than Caucasians to develop pancreatic cancer. Having a family history of pancreatic cancer. Having medical conditions such as diabetes, chronic pancreatitis, cirrhosis of the liver, or stomach issues such as ulcer-causing bacteria. Jaundice, which often occurs if pancreatic cancer spreads to the liver. Pain in the back or abdomen. Unintentional weight loss or lack of appetite. Keep in mind that these symptoms are oftentimes caused by other conditions; regardless, it’s important to have any concerning symptoms checked by a doctor as soon as possible. In 2015, the American Cancer Society predicts that 24,000 new cases of stomach cancer will be diagnosed. Stomach cancer was once the leading cause of cancer death in the U.S., but after the 1930s this changed. It’s possible that the use of refrigeration made it possible for people to eat more fresh produce, avoiding smoked and cured foods (which increase the risk for stomach cancer). Our high rate of antibiotic use can also play a role, since antibiotics help kill the bacteria H pylori, which can cause stomach cancer. Outside of the U.S., stomach cancer is still among the most common cancers. Age, gender and ethnicity. Stomach cancer is more common in men, older adults, and Hispanic-Americans, African-Americans and Asian/Pacific Islanders. Smoking and tobacco use can double your stomach cancer risk. Diets with large amounts of smoked, salted and pickled foods increase the risk for stomach cancer. The nitrates in cured foods can increase the levels of H pylori bacteria in the stomach, which can cause stomach cancer. For unknown reasons, people with type A blood are more likely to get stomach cancer. Certain genetic conditions including CDH1, BRCA1 and BRCA2. Having a family history of stomach cancer. Lack of appetite or losing weight unintentionally. Abdominal pain or vague discomfort in the upper belly. Feeling full after small meals. Nausea and vomiting, with or without blood. Whether you choose to wear an awareness ribbon, share what you learned about these cancers, or participate in an awareness walk this November, you can help make a difference in the future of lung, pancreatic and stomach cancer. If you’re planning on wearing an awareness ribbon, check out our awareness ribbon guide infographic and consider sharing it to help spread awareness all year round. Another way you can make a difference this November is by donating your car to Wheels For Wishes, benefiting local Make-A-Wish chapters. The proceeds from your car donation will be given to your local Make-A-Wish chapter to help them grant more wishes to children facing critical illnesses. To donate your vehicle to Wheels For Wishes, please call 1-877-431-9474 or donate online with our donation form. Each donation makes a difference!